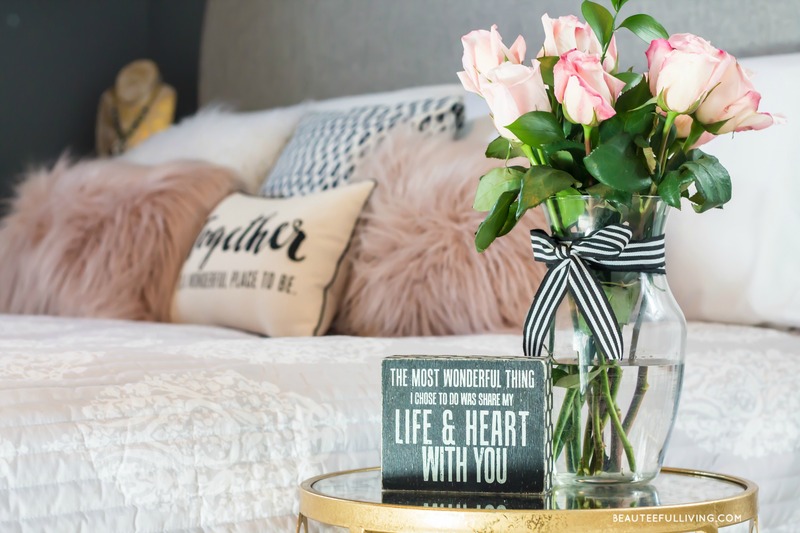 You may recall back in this post, a group of my blogger friends and I participated in a Secret Santa Gift Exchange, hosted by the Shabby Grace Blog. Along with that gift exchange, we also did a “thrift item” exchange. We were all directed to purchase a thrift item with a $5.00 price limit. Since my Secret Santa was Heather from the Dean’s List Blog, she was also the one who sent me my thrift item. Remember how much I loved the gifts that Heather chose for me? Well, when I saw her thrift item, I knew I had myself a challenge. Why, Heather? I thought we were friends? You are putting me to work! 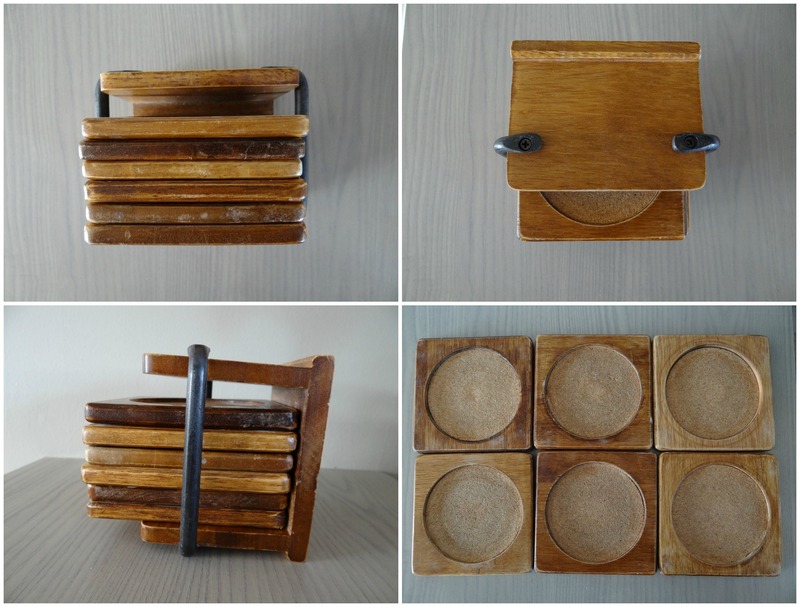 🙂 All kidding aside, this was such a cool thrift item to flip! Do you see all that old school, honey-colored wood grain type of wood? I knew EVERYTHING had to be repainted. While there were many pieces to be painted, I was fortunate that I did not have to sand each of these items. 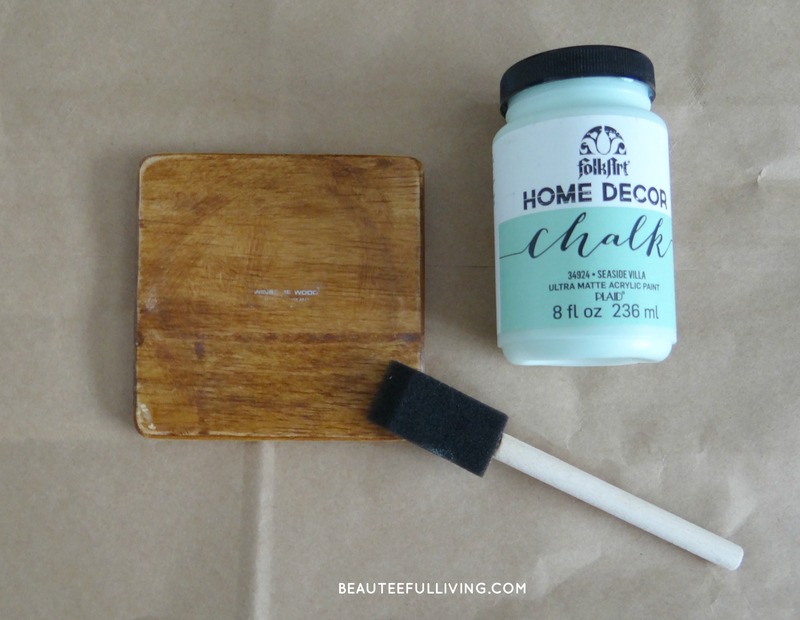 Chalk paint is excellent for projects such as this! 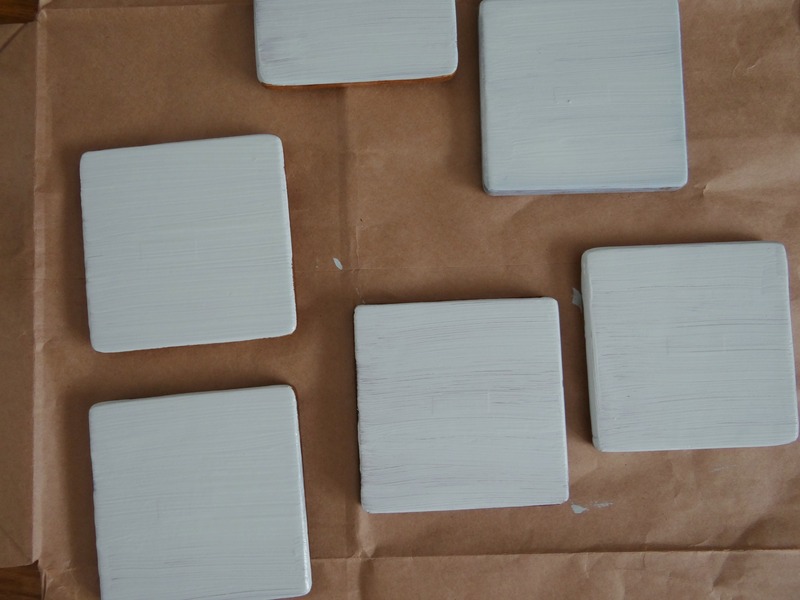 I love the “Seaside Villa” color that I used on the coasters. This is how 1 coat of paint looks. Don’t worry about coverage. Giving it 3 coats will make everything look evenly coated. After the bottom of the coasters have dried, I painted the top while leaving out the center. 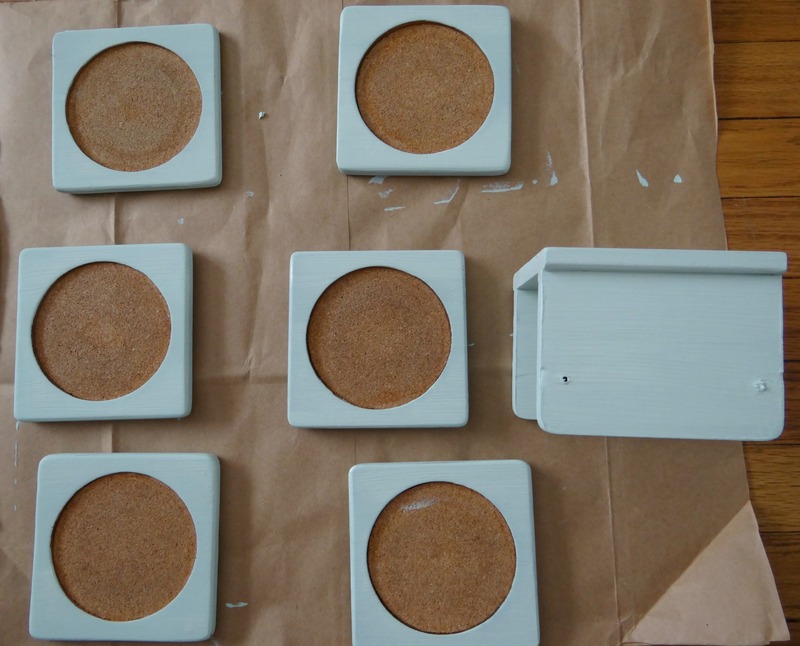 I wanted to paint the center cork area with a darker colored chalk paint for contrast. 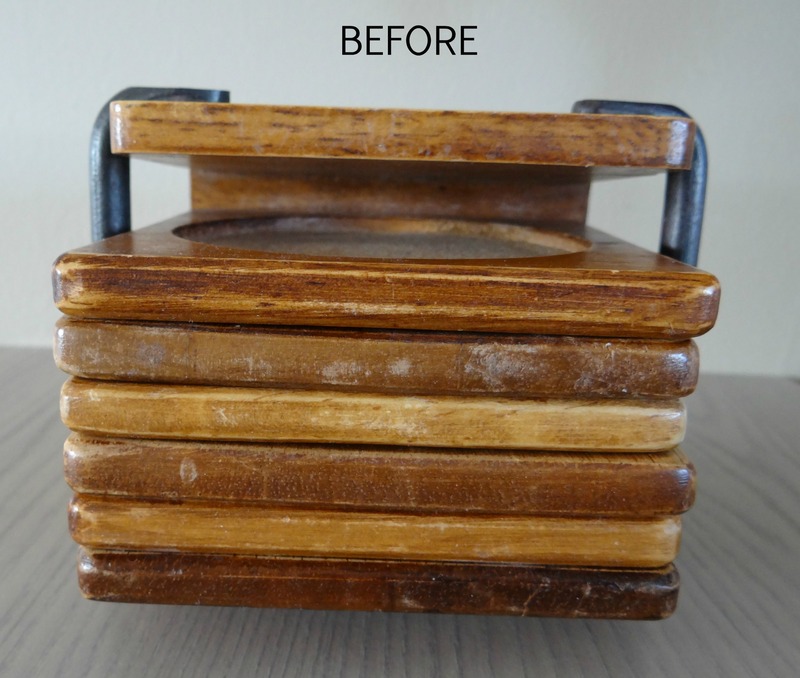 Notice that I removed the metal hardware from the coaster holder. 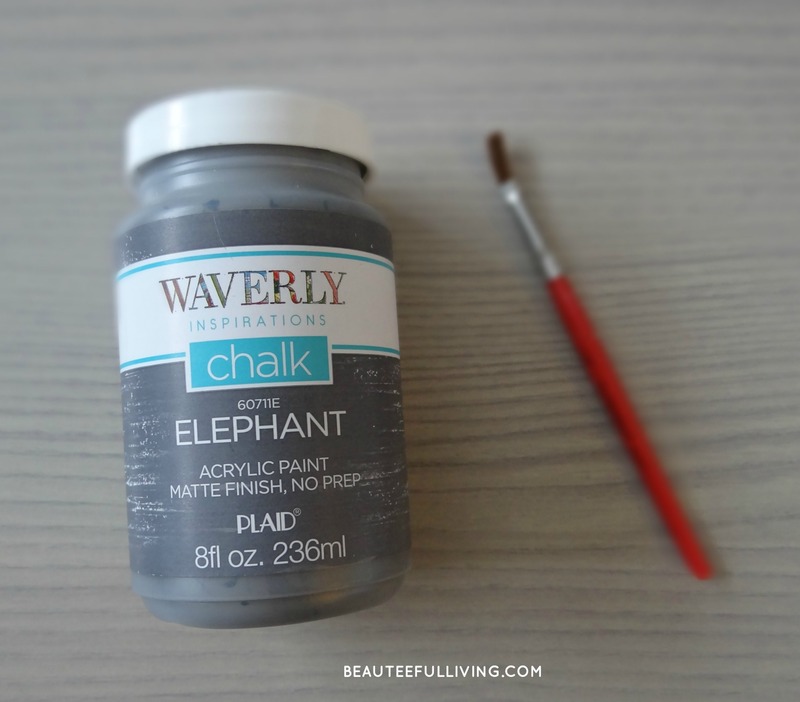 For the center, I applied Waverly Chalk Paint (Elephant color) with a thin-bristled art brush. 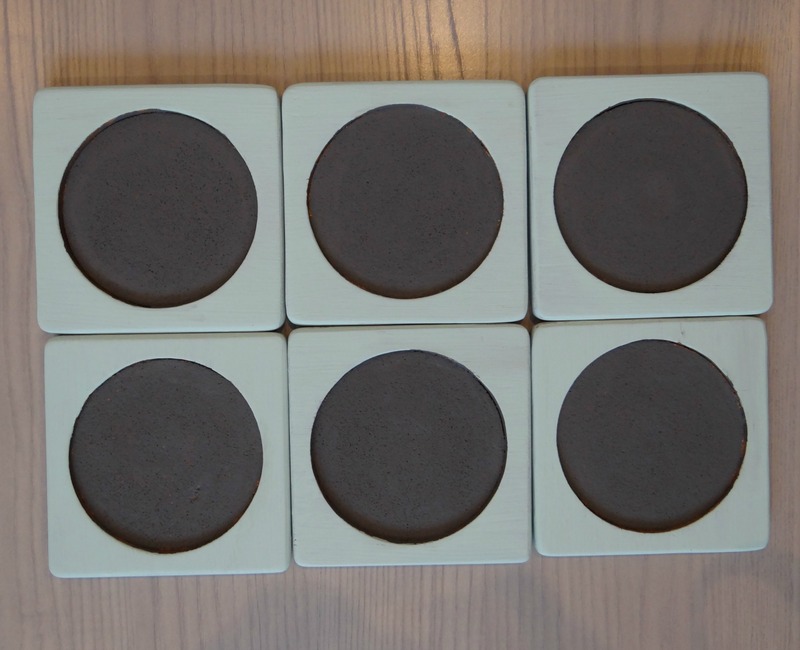 All 6 coasters are all painted and ready for next step. I listed the Top 6 Activities that our family enjoys doing together on each coaster! On weekends, the kids can pull one of the coasters out and whichever activity gets selected, we will do as a family! P.S. New discoveries mean visiting a new restaurant, new town, new museum, and etc. 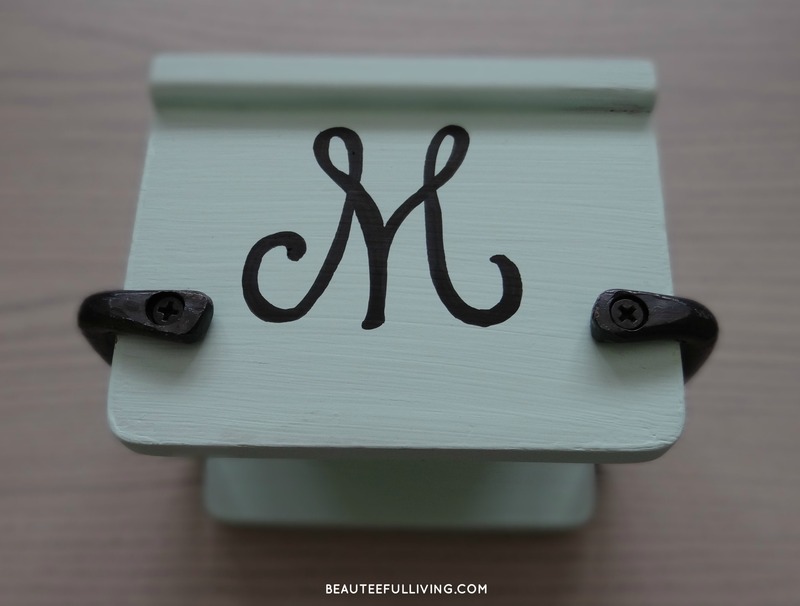 For the top of the coaster holder, I decided to draw a simple monogram to represent our surname. 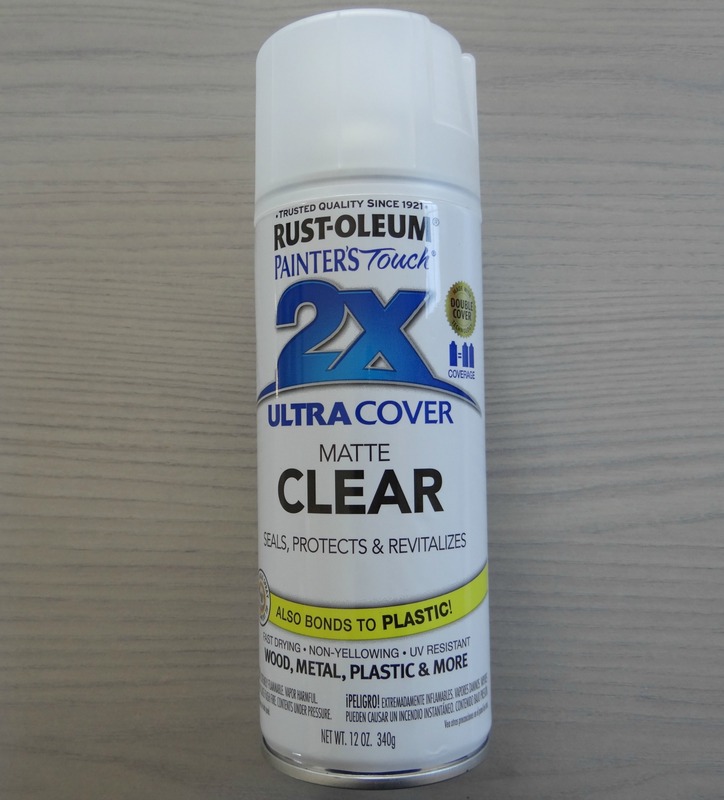 The last step I did for this project was to spray the repainted surfaces with a spray sealant. 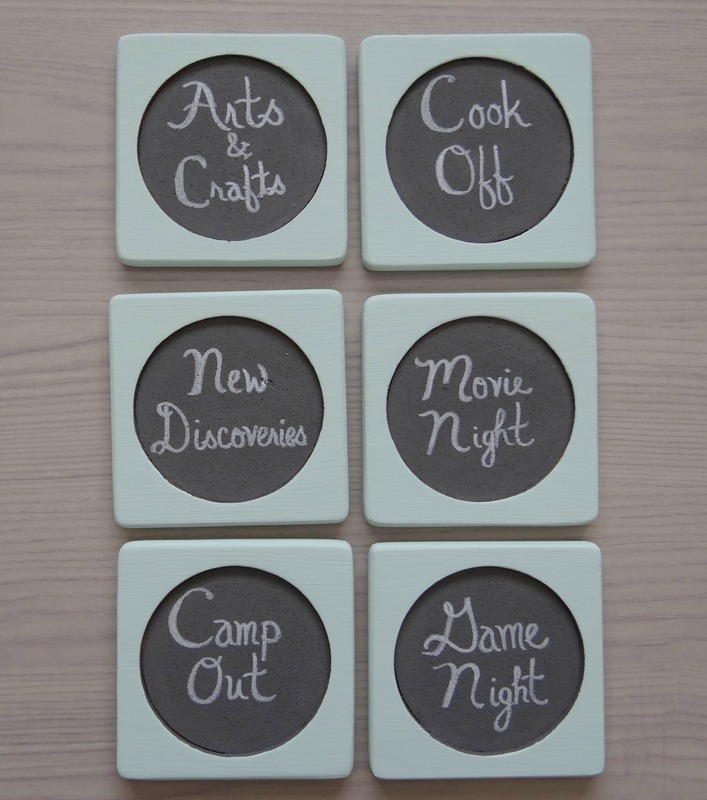 Here’s how our “Family Night Coasters” turned out! I have to say I’m really pleased with the results. No more old wood grain! Enjoyed this project? Please PIN and Share with others. Thanks a bunch! Thank you so much, Heather, for sending me this thrift item! I really love how this project made me stretch my creativity. Also, big thanks to Sara from the Shabby Grace Blog for organizing this fun thrift exchange! Thanks for stopping by the blog! Xo, Tee. Those turned out really cute. Amazing what you can create when you have limited options! you are so innovative! this is such a great idea…family fun made easy! Thanks so much, Marie! 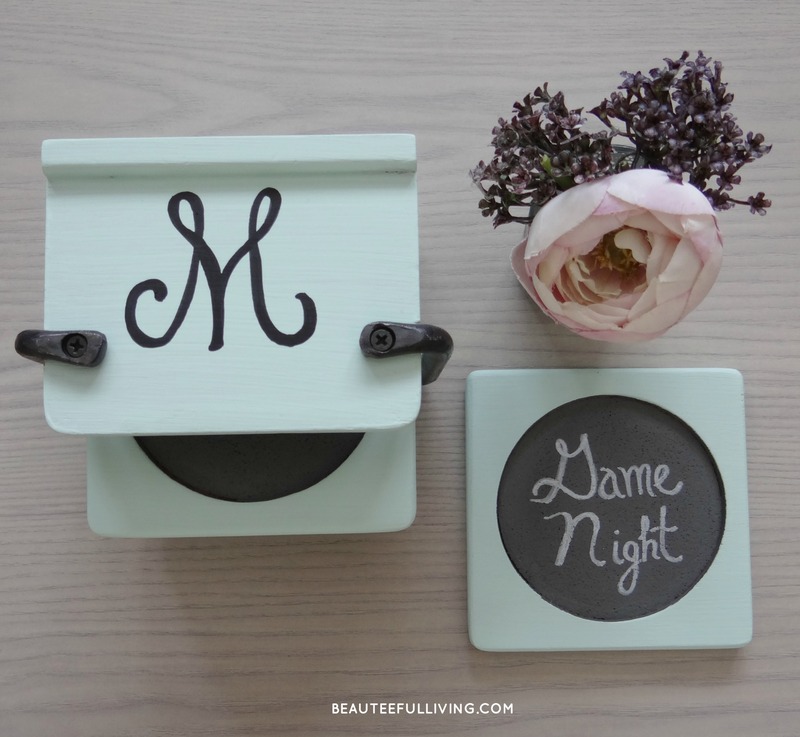 I appreciate you for stopping by the blog and for pinning this :). Love this, Tee! 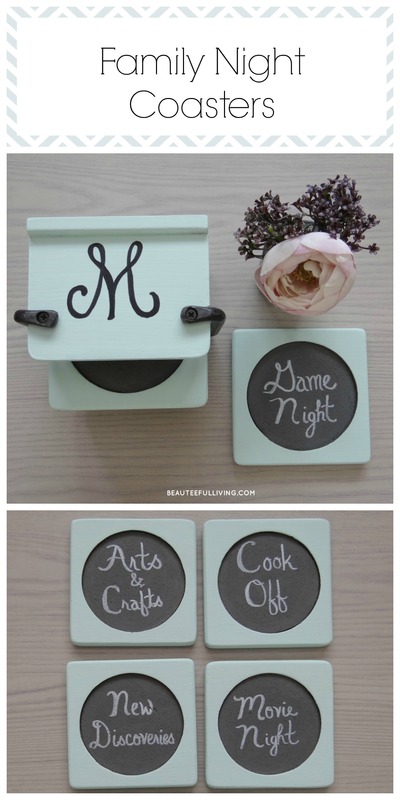 Such a great idea for the family, and I love the paint color and monogram! Adorable Tee!! You’re so creative I love it! Super cute Tee! Thank you so much for my wonderful gift! Thanks, Cat. You’re very welcome. Glad you like your gift! I love the way these turned out! So lovely! Look at you! I knew you could do it! 😉 – but in all seriousness, what a fun idea of a way you can incorporate your family into a DIY project! Thanks, Heather! Really appreciate all the items you got me for both blog hops! What a fantastic idea! Well done! I love these! What a difference paint can make! Yes, paint definitely made a huge difference with this project. Thanks for commenting.